I was helping my roommate out by going with him to the home and garden store with my pickup for a few big purchases, and I saw this little dixie cup sized plant with no price tag and no label sitting forgotten in the lumber section. I have never tried to grow houseplants, but it looked sad and I decided what the hey, I'll buy it. The cashier had no idea what it was and gave it to me for free since my roommate was making a purchase anyway. 5 months later here he is. 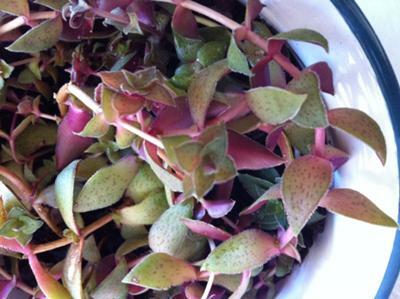 Fleshy leaves with a pink underside and freckled green tops. I have no idea what he is, but he is significantly bigger than when I started so I figure I am not doing too terribly making it up as I go along ... but I would like to know what it is in order to care for him properly. Also, if he has flowers, what will they look like? Thanks for all your help! Oh, Ferdinand is very cute - good haul! This looks like it could be some kind of Crassula, but apart from that similarity, which I'm basing on the fleshy leaves arranged in opposite pairs, I'm not sure which species it might be. However, they are all pretty easy to grow, and great for a beginner, so you've lucked out with that. See the page on Crassula for more, and also succulent care for some generalized cultivation hints. The flowers, if it does bloom, and it is some kind of Crassula, will most likely be a cluster of pink or white flowers that will be fragrant. These types of plants have to be quite old and rootbound before they want to bloom - something to keep in mind. Comments for Succulent without a label that I have named Ferdinand. 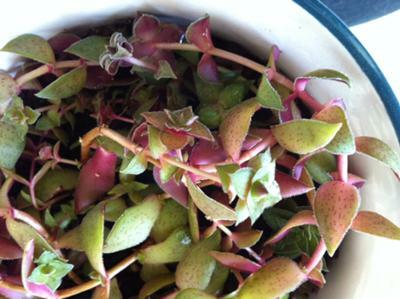 This looks like a dwarf Bolivian wandering Jew. Callisia repens...sometimes known as chain plant, turtle vine. It certainly does resemble Callisia repens.